Many people turn to alternative medicine for the treatment of cold symptoms. Unfortunately, vitamins and herbs have not proven conclusively to be beneficial for colds and flu without adverse effects. Below are some commonly used and studied examples. Echinacea is a very commonly used herb for the common cold and flu-like illnesses, but there are no conclusive studies on its effectiveness and safety. A review of 24 trials with more than 4,600 people was conducted to test the effect of echinacea on treating common colds. Overall, it was found that there was not much of an effect for both prevention and treatment of a cold. Some warnings on echinacea claim that it is an immune stimulant, so should be avoided in those with autoimmune diseases like rheumatoid arthritis, lupus or severe allergies. 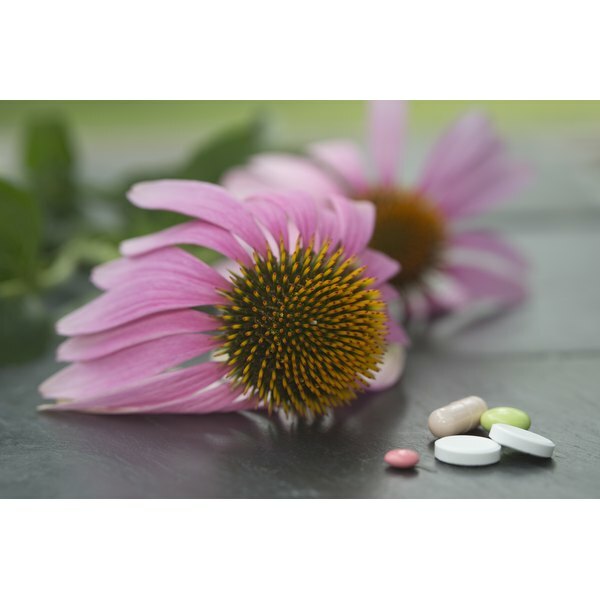 Also it can cause some drug interactions, so be sure to check with your doctor before taking echinacea. Zinc has been well studied, and though it may reduce the duration of symptoms of a cold, there have been cases of permanent loss of smell with zinc nasal sprays. Vitamin C is very commonly used in hopes of both treating and preventing colds. As a treatment, in a 2013 review of 29 trials and 11,306 patients, there was a small (8 percent) reduction in the duration of cold symptoms at doses of 200 milligrams per day. Vitamin C use for prevention has not been proven to be effective, except in patients who exercise vigorously, especially in extreme conditions. For example, in marathon runners, skiers and subarctic exercisers, there was a 50 percent decrease in the amount of colds when taking vitamin C.
Regarding vitamin D, one study showed fewer colds in people with higher vitamin D levels. Two other studies, however, showed that there was no difference among those who took vitamin D supplementation versus a sugar pill (placebo). With regard to probiotics, one 2015 study compared the use of probiotics to a placebo among children and adults with colds, and the patients who took probiotics had fewer and shorter-duration colds. I believe, however, that more trials are needed to be sure of this claim. Saltwater rinsing may be helpful in washing out viruses and helping with congestion, though it is very important that the water used is either distilled or boiled. If not, there is a risk of infection in the sinuses that can travel to the brain. Patients can buy distilled or sterile water, or the CDC recommends tap water only if it has been boiled for one minute, then cooled. (At high altitudes, such as over 6,500 feet, boil the water for three minutes). Alternately, a water filter designed to remove bacteria can also be used to sterilize tap water. As long as the water is sterile, sinus rinses can be done mulitple times a day. In 2012, a study published in the journal Pediatrics compared a dose of honey to a placebo on the effect of nighttime cough and difficulty sleeping in children with upper respiratory tract infections (cold symptoms from the throat and above). There were three types of honey used: citrus honey, eucalyptus honey and labiatae honey. This was a double-blind study in which neither party knew whether they were getting the honey or the placebo. There were 300 children, all who had been sick for seven days or less. Researchers were looking to see if the severity and frequency of the cough was reduced and if the children slept better with the honey. The results showed a greater improvement in the honey-treated group. The study was conducted over the course of two days. The conclusion was that honey may be a treatment for cough and sleep difficulty associated with childhood upper respiratory tract infections. Warning: Honey should never been given to children less than 1 year old, due to the risk of infant botulism. How Do Zinc Lozenges Work?